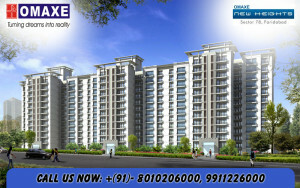 Omaxe new Heights Flats – After the great success of omaxe heights omaxe group has come up with an elegant residential development at sec 78 of greater Faridabad by the name of omaxe new heights. The compact project of four towers offering apartments of varied sizes strategically placed on 60 mt wide road and is having close proximity with the upcoming commercial developments. Ten mins walking distance from schools, shopping areas, hospitals etc.